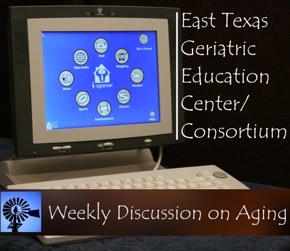 Since the Weekly Discussion on Aging begins next week with this blog as its subject matter, I though the examination of computer use by the elderly might be a good beginning topic. See the Discussion tab above for more details. I dug into my past for a memory of elder computer use and into the web for some more general findings. When my Dad was 80 years old he had a stroke. It left him in a wheelchair with limited speech and almost no use of his right hand. This happened in 1990 and he died 13 years later at 93. Because of his loss of mobility and limited speech he became increasingly isolated. As the availability of the Internet grew, it appeared possible that email might allow my Dad to stay better connected with friends. I discovered that his stroke had caused some cogitative problems as well and he could not learn to use my laptop. The interface was too complicated. My dad was an innovative mechanical engineer and always grasped and used the latest technology. To see him lose the ability to understand a tool and its use engendered a feeling of deep sadness in me. I cry inside remembering it. In 1999, I discovered an Internet appliance called the i-opener (see picture of it above). The i-opener was a specialized computer that offered up email and downloaded news, weather, entertainment, sports and provided limited on-line shopping (http://en.wikipedia.org/wiki/I-Opener). The company stopped making this product fairly quickly but I got him one of the first ones. He was able to navigate the simple interface and the i-opener, with it’s automated operation, worked quite well for several years. Dad liked to read the news each morning and emails. The i-opener was a dial-up device and it downloaded the news and emails during the night. He was not good at replying to emails as typing with his left hand was difficult. Eventually the i-opener was no longer supported and my father lost further functionality and the i-opener was retired from use. But for awhile it was a useful tool and served it’s purpose. Now, lets look at the use of the virtual worlds by older people. There are a number of virtual worlds available. Second Life® (http://secondlife.com) and IMVU® (http://www.imvu.com) appear to be the largest virtual worlds and but many others exist ranging from tiny to huge. OpenSim (http://opensimulator.org/wiki/Grid_List) is a open source collaborative that supports people who develop virtual worlds. Second Life, as the virtual world we will use for the weekly discussion, provides software and access for free and allows users to create almost anything imaginable. The average monthly use has remained stable since 2010 at around one million users logging in each month (Linden Lab, 2011). These users live and move among a land area, composed of a mainland and islands, of about half a million acres. UTMB has an island that is about 16 acres in size. Thus, we will meet in a small corner of a very large place. In 2007, about 12% of Second Life users were over 45 years old (Pascu, 2008). In 2008, it had increased to 21% (Borst, 2009) and more recent data could not be found. In addition, I found very few articles that connected the elderly with virtual worlds. Siriaraya & Ang (2010) interviewed nine participants in the IMVU® virtual world who were between 55 and 65 years old. They concluded that these participants found the virtual world useful and enjoyable. Most had chosen to virtual world due to some loss of mobility in the real world and the virtual world offered freedom of movement and access to a large pool of potential contacts. Another article by Sawyerr & Pinkwart (2011) did not examine elder participation in virtual worlds but describes some design aspects for a virtual world designed for seniors. This hypothetical world would have a simplified interface and be designed for users with limited cogitative and/or motor skills. Borst, T. Know Your Customers: Second Life Demographics. Blog posted April 30, 2009 at http://xdfusion.wordpress.com/2009/04/30/know-your-customers-second-life-demographics. Pascu, C. An Empirical Analysis of the Creation, Use and Adoption of Social Computing Applications. European Commission, Joint Research Centre, Institute for Prospective Technological Studies, 2008 (http://ftp.jrc.es/EURdoc/JRC46431.pdf). Held in Second Life on the UTMB campus. Professor Kay Texan: What have you done so far to alert the UTMB community about this? Rodger Markova: Well, I have asked Tony to have his secretary arrange for continuous notices but I don’t know what has been done. Rodger Markova: Rebecca, can you see the blog post in the media board above the fireplace? Professor Kay Texan: I can see the screen, but it’s white. Professor Kay Texan: I’ll activate it. Rodger Markova: Well, we are out of time and I thank all of you for coming. Professor Kay Texan: I’ll just fly away! Bye. Sorry for walking over you Don! Saphira Avindar: bye – I am looking around.